The Polliwogs are holding trial Yoga sessions for parents as well as children in May.Enjoy a trial session at only $10 (U.P $28) and get a free $10 F&B voucher redeemable at The Polliwogs café. Places are limited and regular classes will be scheduled after these special classes. The kids' yoga is for children aged 3-6 years old and and will be run by KJ Loh, a certified Epona Yoga® instructor with Holistic Kids, a boutique kids' wellness centre in Singapore. Epona Yoga is a fun and interactive Children’s Yoga Program that provides an inspiring mix of creativity, relaxation and gentle exercise. The adult yoga class is with Adeline Lum, a qualified yoga instructor as well as Pilates Teacher and Reiki healer, and is one of the partners of Satya Yoga. Adult yoga sessions are held at 10.00am on Tues, 4 May and Mon, 10 May. 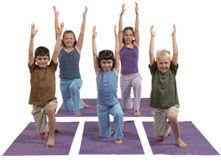 Kids' yoga sessions are held at 5.00pm on Tues, 18 May and 25 May. Registration must be done at The Polliwogs and payment made before the class. Please bring your own mat and towels. It sounds very interesting. I hope I can try this because my daughter is only one month short to 3 years old. Thank you for sharing!